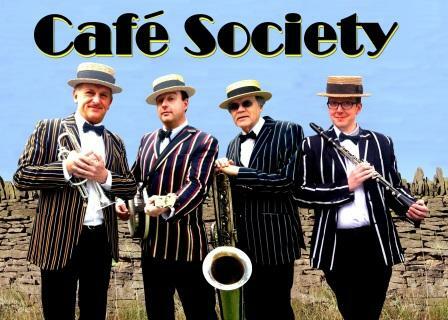 Cafe Society, an unusual and rather unique quartet that have taken it upon themselves to create the ultimate 1920s experience presented with wit, charm and occasionally devastating humour! Café Society presents their tribute to the rip snorting era of the 1920s and 1930s. This unique band has painstakingly transcribed the original orchestrations that make the 1920’s sound so distinctive. With a mixture of lively music, audience participation and devastating humour, they take you on a musical meander down memory lane with tributes to such stars as Al Jolson, Noel Coward and even George Formby! In shopping centres, children gawp amazed, and hooded chavs cease their thuggery. On piers and bridges, they have shown many a potential jumper that life is still worth living! At football matches they have proved a useful draw for an angry crowd!